A wave higher than Nelson's Column and travelling faster than a jet aircraft will devastate the eastern seaboard of America and inundate much of southern Britain, say scientists who have analysed the effects of a future volcanic eruption in the Canary Islands. A massive slab of rock twice the volume of the Isle of Man would break away from the island of La Palma and smash into the Atlantic Ocean to cause a tsunami - a monster wave - bigger than any recorded, the scientists warned yesterday. Most of the wave's energy, equivalent to the combined output of America's power stations for six months, would travel westwards to the American coast but enough would be flicked north towards the English Channel to cause catastrophic coastal damage. "We're looking at an event that could be decades or a century away - but there will be a degree of warning beforehand," said Simon Day, of the Benfield Greg Hazard Reseach Centre at Univeristy College London. Most of the rocky western flank of Cumbre Vieja is unstable enough to be dislodged in the next big eruption of the volcano, which is active enough to explode at least once or twice a century. Its last big event was in 1949. Such a landslide from a future eruption could travel up to 60 kilometres (37 miles) from La Palma's coast, causing the formation and then collapse of a dome of water 900 metres (3,000ft) high and tens of kilometres wide. The bow of this collapsing dome of water would become a giant wave, but also, as the landslide continued to move underwater, a series of crests and troughs would soon generate the "wave train" of the tsunami. With the leading wave in front and crests pushing it on behind, it would sustain the power for the nine-hour journey to the American east coast. Tsunami means harbour wave in Japanese and, though the occurrence has nothing to do with the tides, it is often called a tidal wave in English. Throughout history they have caused widespread devastation, with Britain last being affected by one in 1755 when an earthquake in Lisbon caused an unusually large wave to hit southern ports. The computer model, compiled in collaboration with Steven Ward of the University of California, Santa Cruz, predicts that the tsunami will have a height of 100 metres (330ft) from crest to trough when it crashes into the shores of nearby north-west Africa. 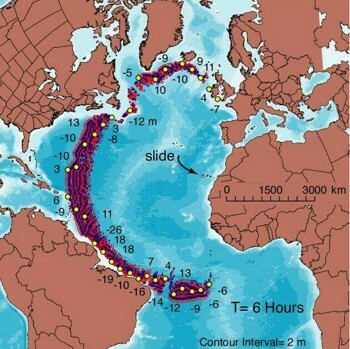 By the time it reached its final destination, the east coast of Florida and the Caribbean islands, the tsunami would still be up to 50 metres high. Low-lying land in Florida would be vulnerable to a sea wave that would inundate the mainland for several kilometres inland. Everything in its path would be flattened, the computer model predicted. Even though the wave would be much smaller when it reached Britain, it would still breach sea defences because it would be larger than the biggest storm waves for which they were designed, Dr Day said. "For low-lying land along the south coast it could penetrate up to a mile," he said. Although there is little doubt that the landslide on La Palma will happen after a volcanic eruption, the difficulty is knowing exactly when it will occur. "Eruptions of Cumbre Vieja occur at intervals of decades to a century or so and there may be a number of eruptions before its collapse," Dr Day said. "Although the year-to-year probability of a collapse is therefore low, the resulting tsunami would be a major disaster with indirect effects around the world." The Pacific Ocean is prone to earthquake-induced tsunamis caused by the so-called ring of fire volcanoes that girdle it. Ten lethal big waves have struck Japan, Hawaii, Alaska, Chile, Nicaragua and New Guinea over the past 100 years. One of the most terrifying tsunamis occurred in 1792 when part of the Unzen volcano in Japan collapsed into the sea, setting up 100m (330ft) waves that killed 15,000 people in nearby fishing villages. In 1868, a powerful tsunami killed 10,000 people when it smashed into the coast of Peru with enough energy to carry an American warship 3km (1.9m) inland. When the Indonesian volcano of Krakatoa blew itself apart in 1883, it generated a wave that killed 36,000 inhabitants of Java and Sumatra. Just 13 years later, in 1896, Japanese deep-water fishermen returned to their home ports to find their homes destroyed and 26,000 dead from a tsunami that must have slipped below the keels of their ships without them noticing. Britain may be hit by a monster wave predicted to devastate the coasts of Florida and Brazil following a volcanic eruption in the Canary Islands. Scientists warn that the UK would probably not escape the disaster unscathed. A weaker, but still hugely destructive, wave is likely to hit Britain's Atlantic coastline. Travelling at speeds of up to 500mph, the tsunami would be an unstoppable force. Its first target was expected to be the West Saharan coast of Morocco, where the wave would measure an awesome 330ft from crest to trough. But the built up coastal areas of Florida, Brazil and the Caribbean were expected to suffer the greatest destruction, according to a new forecast by Dr Simon Day, of the Benfield Greig Hazard Research Centre at University College London. Here, the wave would reach heights of 130ft to 164ft - higher than Nelson's column - and travel four or five miles inland flattening everything in its path. Previous research by Dr Day predicted that a future eruption of the Cumbre Vieja volcano was likely to cause the western flank of the mountain to slide into the sea. The energy released by the collapse would be equal to the electricity consumption of the entire US in six months. Working with Dr Steven Ward, from the University of California, Dr Day has now produced a new model which predicts more accurately how big the tsunami will be and where it will strike.